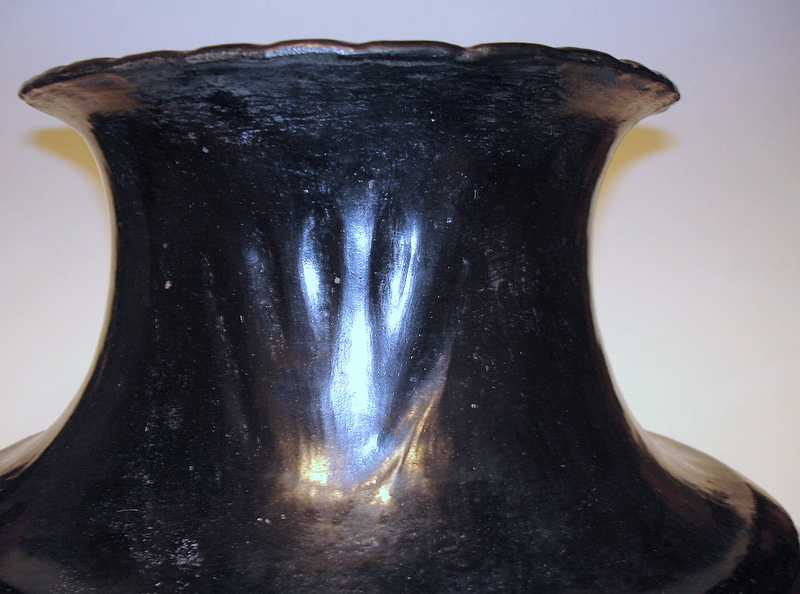 “The symbol most directly associated with Sara Fina is the bear paw, which has been used on Santa Clara pottery since at least 1200 ad (Peterson 1997, 55). Its use comes from an old legend: during a time of drought at the pueblo, a bear led the people to a freshwater spring and saved them. As Margaret explained it, “The bear always knows where the water is, and this is a design we put on the water jar, the storage jar”. Below the medallion is an impressed avanyu. 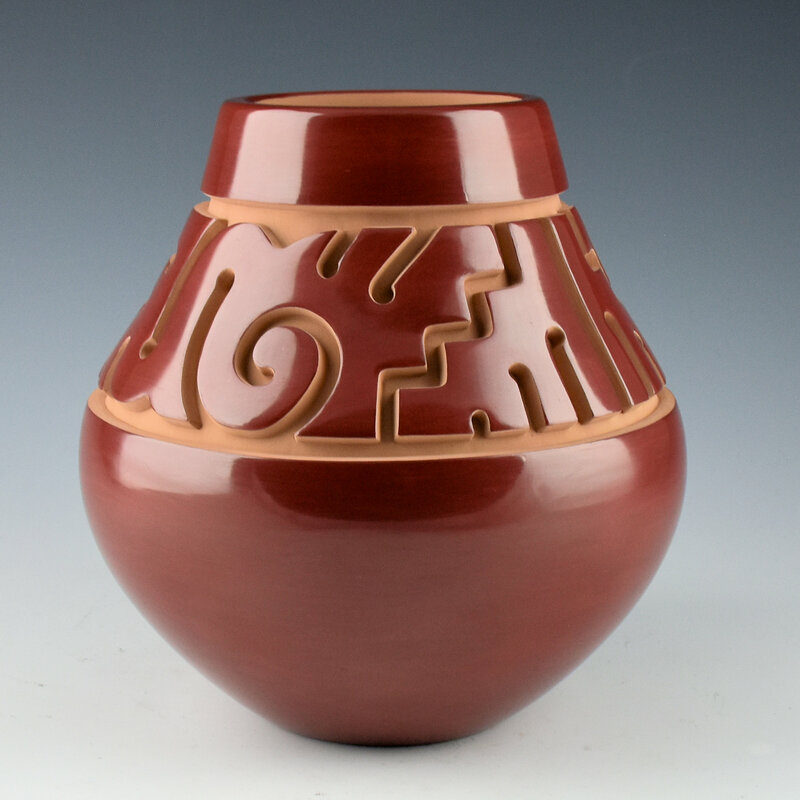 This is one of the designs used by Sarafina in 1922 on some of her first “carved” vessels. Nathan said that he wanted to explore this idea and try an impressed design. He said there was an unexpected difficulty in polishing so many angles in the impressed pattern. The result is quite stunning. Take a look at the photo of the bottom of the jar and you can get a great view of the avanyu from a different angle! 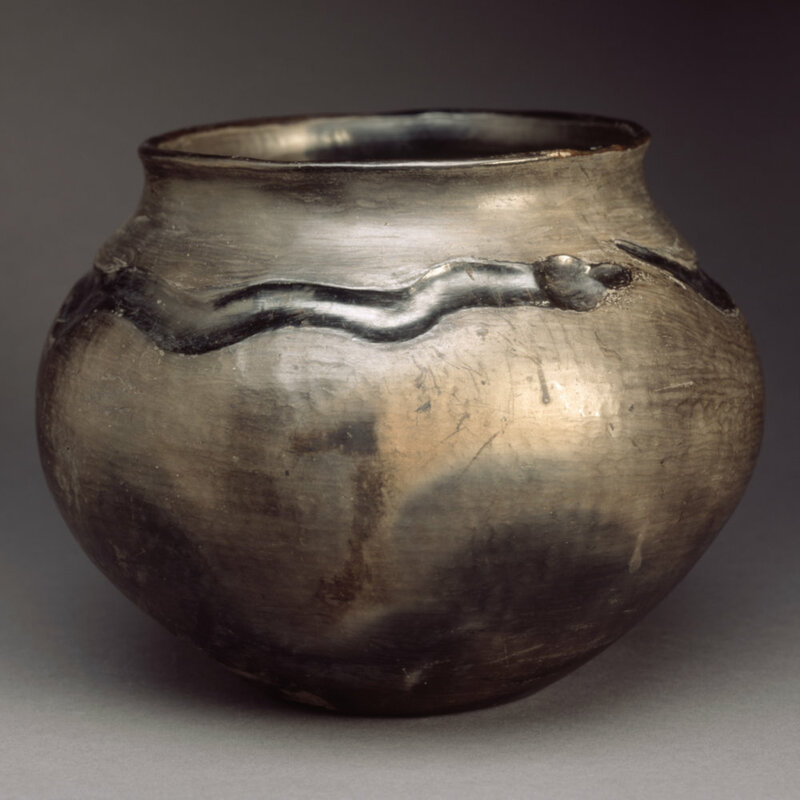 The remainder of the jar is carved with a mountain and cloud pattern which encircles the piece. It is a complex design yet ties together the imagery of the bear paw and the avanyu. 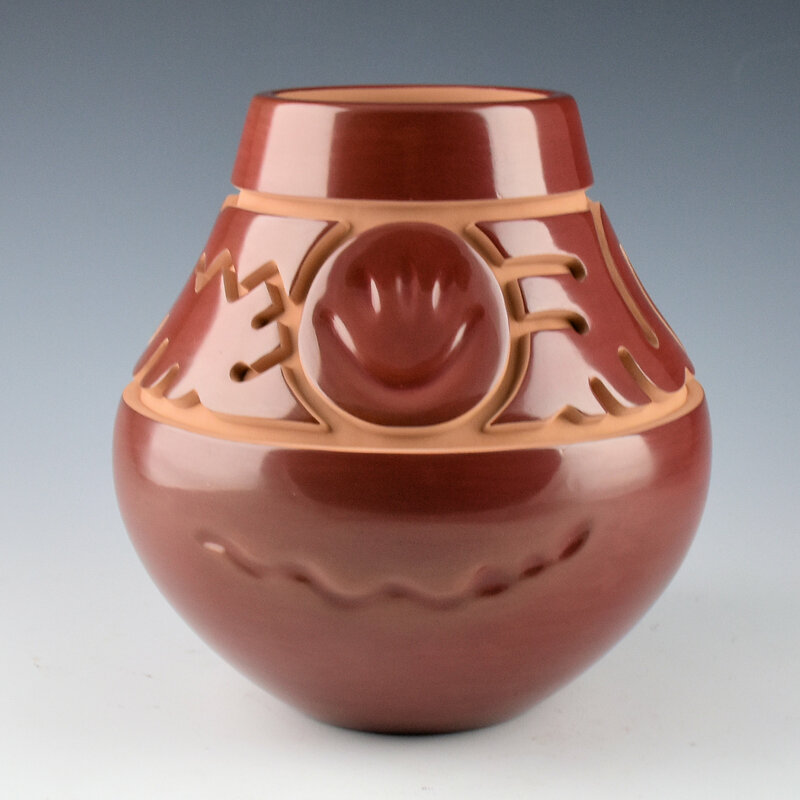 The red clay slip is deep and rich in coloration and the jar was traditionally fired. The polishing is spectacular on this jar with an amazing shine from the stone polished surface! 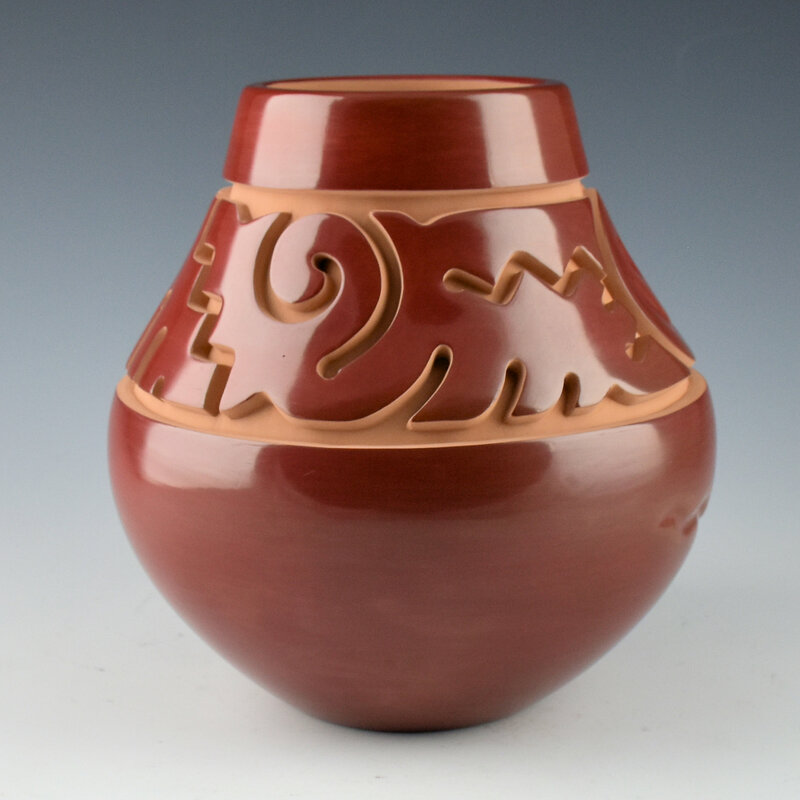 While the shape, carving, and designing might seem like enough, Nathan also takes his pottery one step further. 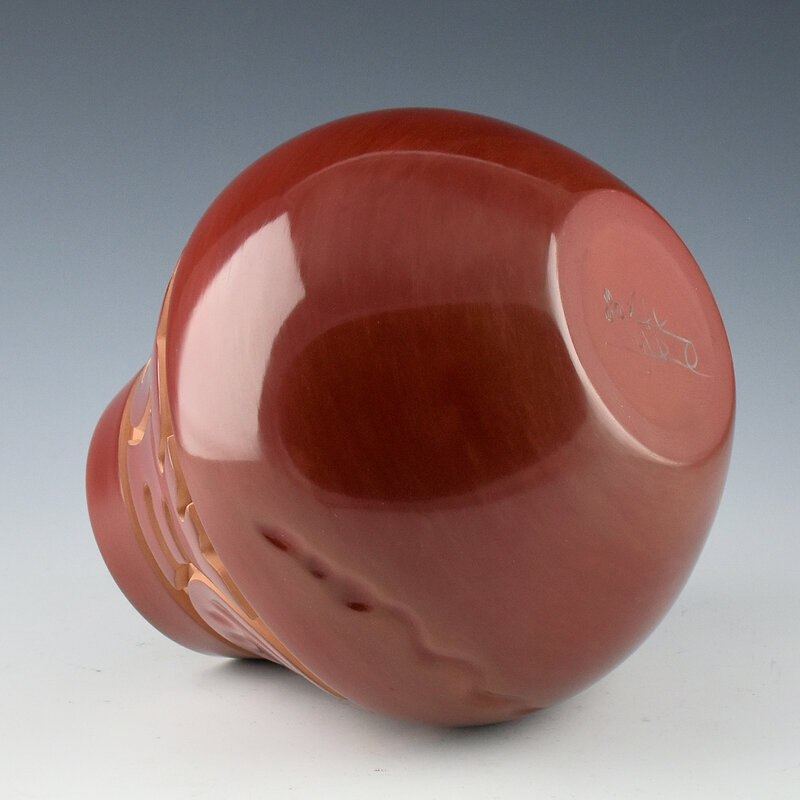 After it is fired, he uses small screwdrivers and scrapes the sides of the carved designs and the recessed areas, to create a visually striking contrast. It is signed on the bottom in the clay with his name and deer tracks, which represent his name in Tewa, which means “Deer Path”.